 Domina St. Petersburg is located on the Moika River Embankment, at the crossroads of cultural, business and social life of the city. St. Isaac’s Square, the Bronze Horseman, the Hermitage and New Holland are all our near neighbours. Sign up for the monthly Domina Digest and receive exclusive offers from Domina hotels around the world. Interesting and to the point, you can receive the single newsletter in your mailbox each month.